A policy a day keeps the chaos away. Does your organization have policies and procedures in place to deal with the stickier aspects of running a history institution, and the risks you might not see coming? It may be painful to imagine a day when you would ever need to deaccession from your collection to support your institution, or to consider a day when you would discover you’ve been the victim of ongoing fraud. Take it from us: it can happen to anyone. Join us for Nightmare at the Museum Week. We’ll be tackling tough topics all week and brainstorming ways that you can prepare your institution for the undesirable and the unimaginable. Learn from experts about how to handle deaccessioning dilemmas and how to proactively fight fraud in your institution during two AASLH Webinars. Then, join us for a live Twitter chat about these issues and how they relate to your experience. Receive a 25% discount on your registration when you sign up for both webinars using this link. Join in on the conversation on social media with #NightmareAtTheMuseum and #HistoryPlansAhead. Deaccessioning should be a discussion at every collecting organization, no matter the size. Dyani Feige works with libraries, archives, museums, and other cultural organizations to conduct needs assessments and risk assessments, assist them in disaster planning, and help them develop policy and planning documents and long-term preservation plans for their collections. In this webinar, Dyani will examine the necessary components of an effective deaccessioning policy, including options for removal, ethical considerations, broad-level legal concerns (not from a legal professional! ), and general best practices. Options for dealing with items that qualify as found-in-collections and abandoned property will also be addressed. A guest speaker will join Dyani to discuss the field’s reaction to several recent high profile deaccessioning cases and how AASLH is working with members to address deaccessioning, as well as AASLH’s Statement on Professional Standards and Ethics revision project. Nonprofit organizations are second only to the banking and financial sector in the occurrence of fraud, according to the Association of Certified Fraud Examiners. Financial fraud can happen to any size history organization, from the very large to the smallest of the small. But it’s only after they become a victim that the vast majority of organizations take steps to protect themselves against fraud. In this webinar, guest speaker Kelly Paxton will discuss the ways fraud is most often committed and then discovered. She will offer recommendations for policies and procedures that can not only prevent a devastating financial loss, but protect staff and board members as well. Join us for this interesting and informative webinar that will help your organization avoid becoming another fraud statistic. Remember, you can save 25% discount on your registration when you sign up for both webinars using this link. What are your experiences with deaccessioning? Why is deaccessioning such a touchy topic? What policies do you have that outline deaccessioning procedures? What are your favorite resources for preparing your institution to deal with deaccessioning? What are your experiences with fraud or fraud prevention? What policies do you have in place to deal with potential fraud? What are your favorite resources for preparing for your institution in these and other tricky areas? Have other questions you think we should be asking the field? Email us and let us know! AASLH is updating its Statement of Professional Standards & Ethics and we want your input! 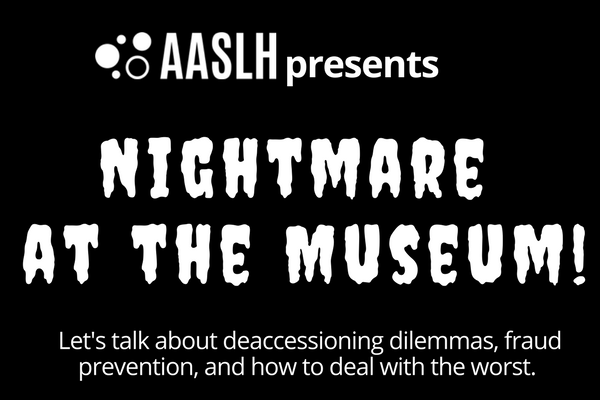 Use the momentum and insight you gather during Nightmare at the Museum Week to review and comment on AASLH’s Statement of Professional Standards & Ethics draft and let us know what is most important to you. If you volunteer for, work in, or support history and cultural heritage institutions, we want to hear from you. Comments will be collected and reviewed by the AASLH Council throughout the revision process. Check out the current statement here. We’ll share an editable version during Nightmare at the Museum Week so you can share your thoughts with us directly.